Hello friends! Hope you all had a lovely week and are relaxing and enjoying the long weekend! This week wasn't too awful busy but next week.... boy oh boy.... I have 6 events/activities happening.. Pray for me that I make it out alive because the following week kicks off KC Fashion Week. It's going to be a wild and crazy rest of September so make sure you're following me on Insta (@samantha_goble)and Snapchat (@samanthagoble) to see what I'm getting up to and behind the scenes! 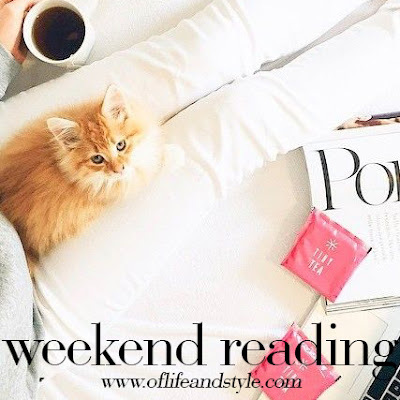 This week's Weekend Reading list is shorter than last week's but still chalk full of great reads and videos. So let's get to it! Here are 11 things every girl has in her bathroom. I'm obsessed with the Buzzfeed Try Guys and their videos but this one is the best. It's crazy how makeup can completely transform someone! Loving this Parisian inspired look and shoot that Kate did! How tres chic! Taylor Swift KILLED it with her new music video for Wildest Dreams. And having Scott Eastwood star in it too was just an added bonus. Most bad@$$ grandma goes to Baddie Winkle. Four beauty trends to try this fall. Wishing I was attending NYFW this month but one day I'll be there. Instead I'll be reading everything there is on it and following all the shows! Interesting articles on fashion and marketing and communications. Definitely going to be reading some of these! I need this hot pink shift dress in my life. I mean it's hot pink, how can I resist?! Loving this autumny makeup look! It's not too overly done or too simple. Would be perfect for a night out. If Eddie Redmayne doesn't win another Oscar for this roll I quit everything. The most glamorous love triangle. I love historical dramas and this one looks super good! You'll bet I'll be seeing it when it comes out. Another super good looking movie starring Kate Winslet and Liam Hemsworth. I'm excited to see this one too! Did you know I started a Youtube channel? Check it out and subscribe to it! Local TV personality Kacie McDonnell tries her hand at doing hair at Posh KC Blow Dry Bar! The Huffington Post names Kansas City the 'Coolest City' in America! How cool is that?! Birthday Wishlist // What item's I wouldn't mind getting for my birthday next week! That's everything for this week! Lots of good movies coming out soon and I can't wait! I'm such a movie junkie.